JUST LIKE THE SURFER DUDE BUT BETTER - IT'S A GIRL! This is the exact same as the "Surfer DUDE" only I have added a ponytail to make it a girl! She has a small stainless steel ponytail welded to her head! For all the surfer babes out there! She has a very smooth sweep that looks exactly like she is carving waves! She will steadily and gently flow up and down in a circle. 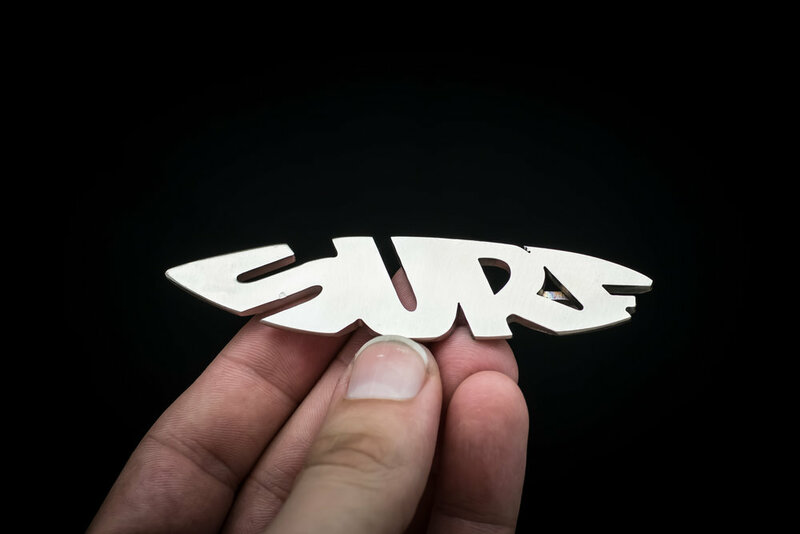 Her board is a solid 1/8" hand-shaped piece of stainless steel! The board also has slight coloration from the natural TIG welding process! UPGRADE THE BOARD! See the photos below. This little board was designed by me, laser cut out for precision, then I hand shape the rocker, nose and add a fin! Space needed for movement: Only an 8" diameter!